The bio of Frank Bradshaw | Launceston Then! Frank was born on July 8th, 1821 to Captain James and Eliza Bradshaw at Runcorn in Cheshire. His father had served in the Royal Navy commanding HMS Eurydice. 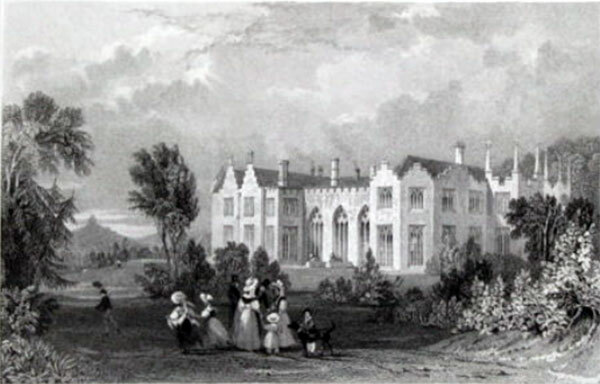 After he came out of the navy, James joined his father in business and was returned in the 1825 as an MP for Brackley. Frank was educated at Trinity College Cambridge. He married Emmeline Buller, daughter of Rev. Richard Buller of Liskeard, in 1858. Together they had six children, Augusta, Emmeline, James, Thomas, Gerald, and Edith. Frank purchased Lifton Park Estate. The house was built in 1815 for William Arundell of Kenegie who inherited the estate in 1775. The mansion was builtin the Tudor style, situated in the valley of the river Tamar and commanding delightful views; the estate covered 7000 acres about 5000 in Lifton parish and 2000 in the neighbouring parishes. Frank had already the family estate of Great Abshot, Titchfield, Hants. Frank was made a Justice of the Peace for Lifton. Frank died on January 19th, 1909 and the estate passed on to his eldest son James Buller Bradshaw. However, James himself died suddenly just six months later.